"The Price is Right" model Manuela Arbelaez thought she would have to come on down to the unemployment line after she mistakenly revealed the price of a new car on the game show. The 26-year-old model said in an interview that she lost her train of thought while exposing the answers to "Five Price Tags," a game that involves correctly choosing a vehicle's value among five oversized tags. Arbelaez accidently unmasked the correct $21,960 price after the contestant's first pick, even though the participant still had two more chances to guess. The goof brought Arbelaez to tears and sent "Price is Right" host Drew Carey into a giggle fit. The clip of Arbelaez's unexpected exposure made the social media rounds online after the episode aired recently. Arbelaez joked about her flub on Twitter, but she said that it wasn't a laughing matter for her during production of that episode. 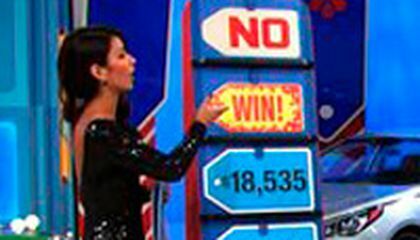 Arbelaez, who has been showcasing prizes on "The Price is Right" for six years, has been surprised by the attention her blunder has garnered. The clip on the show's official YouTube channel has received more than 3 million views. I think that it would have been funny to watch the model accidentally reveal the correct answer. The model is named Manuela Arbelaez and she was very nervous when it happened. She was just out of her mind when it happened. She didn't even know what was happening until it happened. She must have been relieved when the people were nice to her and she wasn't fired. Many people made mistakes on the show but this was the most expensive. There was a video of it and it went viral. I think that Manuela wasn't fired because many people made mistakes on the show. The people were nice to her and could tell she was nervous. She was also experienced in the job and has been working for six years in it.